Every society has rules and regulation guiding it. We are guided by these rules in every activity we partake in. Sport is not an exception as there are rules guiding every sport whether one is a pro or amateur. We have seen athletes punished and sanctioned because of flaunting some of the rules of the sport they partake in while some have been banned out rightly for disobeying or doing things that contravene the rules of the sport they partake in. However, i have never heard that an athlete was disqualified for taping her ears because she pierced them. Lol. This is the full gist. On April 10,Kansas teenager, Miranda Clark was getting ready to line up for the start of the 1,600-meter race at the Ellsworth Invitational. The Russell (Kan.) High student was ready to roll when she noticed that she had earrings in, a result of a recent ear piercing. 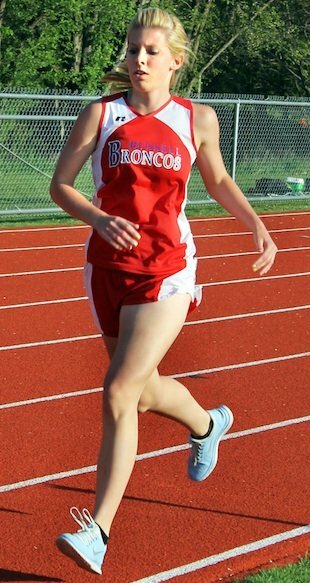 Knowing that wearing jewelry in a race is forbidden in sporting events by the Kansas State High School Activities Association, Clark knew she couldn't run with her earrings showing, so she did what most athletes do to make jewelry less conspicuous: She covered them up with tape. Perhaps most infuriating for Clark and her teammates was this bizarre technicality: If Clark had left her earrings in but not covered them up with tape she would have only received a warning and not been disqualified. As such, by trying to do the right thing, the Russell runner was punished more harshly than if she had openly disobeyed state regulations. That's precisely the case that a member of the extended Clark family tried to make in an email to KSHSAA assistant executive director Mark Lentz that was obtained by Prep Rally. In his response to an open query about Clark's dismissal from the meet, Lentz said that the teen should only have been disqualified if she had been warned about wearing the earrings earlier in the event. Lentz stressed the importance of "preventive refereeing": warning athletes like Clark that they are at risk of a violation before they actually start an event. Yet Lentz also failed to address whether the official's decision to ban Clark was right or wrong, and agreed that it should have been done on the basis of "unsportsmanlike conduct" because it was related to jewelry … even though Clark went out of her way to ensure her jewelry was not showing. While acknowledging the fact that "Miranda was wrong for having the jewelry in her ear and she knows that, Mary feel that to be disqualified from competition because they are putting tape on it is a little extreme. According to him the competition is just high school sports, which should be promoting and encouraging young people to compete and be active, not discouraging them.